The Funnier Side Of Monbiot & Schmidt's "Plimer Débâcle"
It is clear that George Monbiot has made himself the loser by not agreeing to publicly debate with Ian Plimer about global warming in London in November. The rule is very simple and universal: a no-show is invariably a loss. The whole thing looks like an elaborate trap prepared by experienced debater Plimer with the goal of convincing Monbiot to run away from the debate. And it looks like it worked. Take Schmidt’s blog on the topic, where he argues that Plimer’s list of questions “is quite transparently a device to avoid dealing with Monbiot’s questions and is designed to lead to an argument…” and then…marches on onto the device regardless! Greenfyre even identifies as “possible answers…to answer them in the spirit in which they were asked…give answers equally convoluted and nonsensical“. If that is so, what is the meaning of going on and on with links to sites where Pilmer’s questions are taken instead at face value? Chris Colose appears to have a vague idea that there is something going on: “all together this is jumbled up nonsense and shows that Plimer is intentionally trying to mislead others“. Mysterious cue then to “for other of Plimer’s questions, I’ll let commenters tackle those“. Isn’t that a way for Colose to participate in the misleading? Tamino…well, Tamino is obviously too superior a human being to recognize a thing. Dear Schmidt/Greenfyre/Lambert/Colose: one suggestion if I may dare. If you are debating with anybody, and they use any logical device of any kind, please oh please DO NOT follow through along the device, for any reason whatsoever. On Feyerabend, or…With AGW Believers Like These, Who Needs Climate Skeptics? 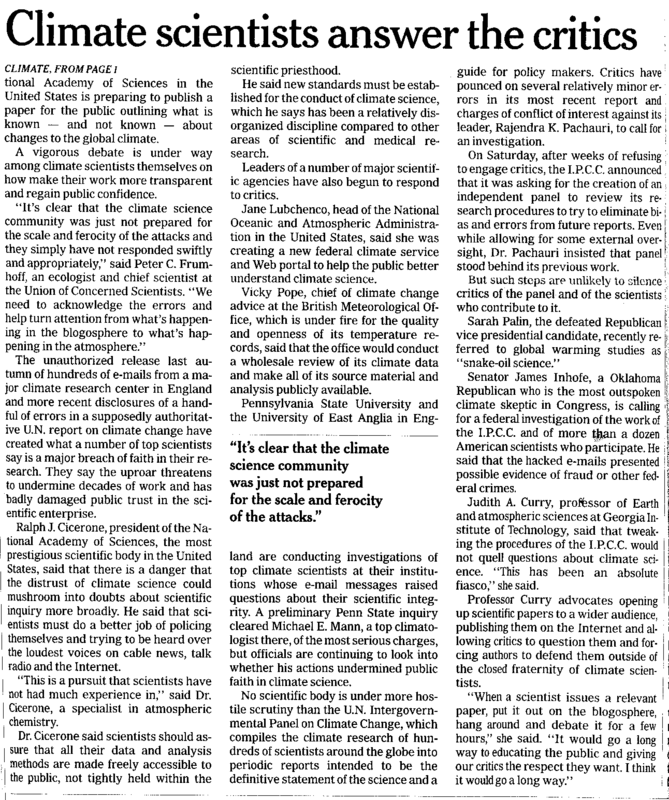 Curious choice of preferred “philosopher of science” for Real Climate’s Gavin Schmidt: Paul Feyerabend. In his 1975 book ”Against Method,” Dr. Feyerabend argued, using Galileo’s grand eloquence and reputed corner-cutting as key examples, that all progress in science depended not only on rational argument but on a mixture of subterfuge, rhetoric and propaganda. Discussing the rise of Western rationalism I pointed out that the transition created more problems than it solved, that most of the problems are still with us, that they do not occur in Homer, that Aristotle was aware of this advantage and therefore adapted philosophy to common sense. [Feyerabend writes that] “Galileo the mountebank” used “deception,” “trickery,” and outright “lying” to promote views he knew he could not prove by rational argument with available evidence; and that’s the way that science develops. Yikes! Points #1. #3 and #4 describe what many have accused RealClimate of doing. 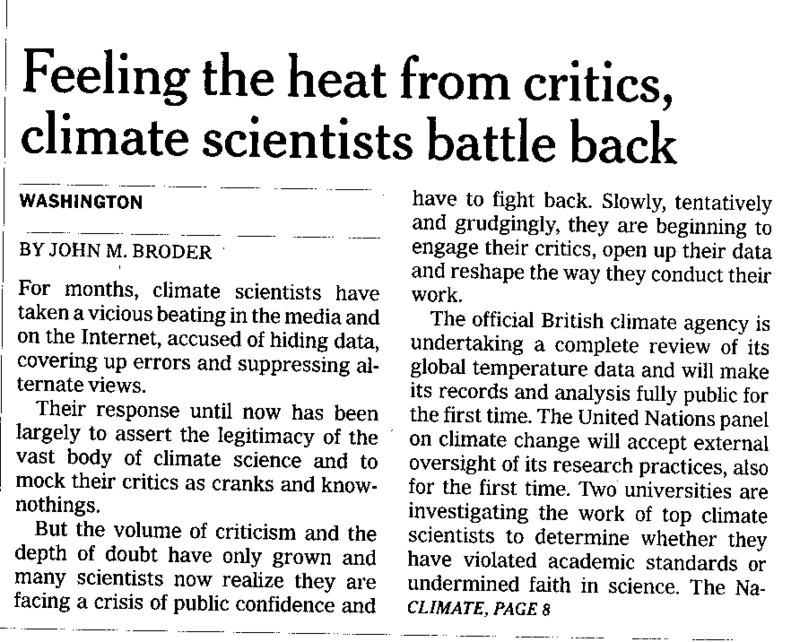 Points #2 and #5 refute the prevalence of climate models over real-world observations. Point #6 is incompatible with the very existence of the IPCC as intergovernmental entity in charge of assessing the science of climate change. Is that really the way Gavin Schmidt wanted to describe his field of work? Perhaps he should have checked one thing or two about Feyerabend first. Because with AGW believers like these, who needs climate skeptics? A “molehill“, says Gavin Schmidt on a RealClimate blog regarding a giant GISS temperature error in Northeastern Russia. A “glitch“. Too bad it was a “molehill” in need of the 1,117 words of Schmidt’s blog. There are two very reasonable replies to such a monumental self-declared waste of an effort, in the Climate Skeptic blog’s “Sorry Dr. Schmidt, But I am Not Feeling Guilty Yet (Part 1)” and “Responses to Gavin Schmidt, Part 2“. For my part, I can only make reference to a basic principle of mine. Whatever you need to show, you are not. There is no need for me for example to wear a tag saying “male”: it’s rather obvious from the way I look. There is not even a need to show I’m Italian, as anybody listening to my accent will immediately find out. So I won’t spend 1,117 words to show either of that. And therefore, what should one make of the fact that Gavin Schmidt felt compelled instead to argue the following? Molehills truly are mountains for very little people. Gavin does seem hellbent on turning the molehill into an even bigger mountain. If he keeps this up, maybe the mountain can turn into a volcanic eruption of Krakatoa like proportions which would then lower the GMST. . .